MIGHTYPLATE MODIFIED BITUMEN SINGLE-PLY ROOFING MEMBRANE is a self-contained, complete roofing and waterproofing system in rolls. 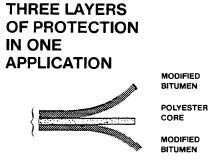 The product is composed of Trevira® Spunbound polyester fabric sandwiched between two layers of APP modified bitumen. It is greater than 150 mils thick, possessing superior heat resistance, low temperature flexibility and excellent workability. It offers both good elasticity and outstanding tensile strength. Unlike conventional built-up roofs, MIGHTYPLATE MODIFIED BITUMEN SINGLE-PLY ROOFING MEMBRANE is manufactured under controlled factory conditions. Maintaining quality control assures a consistent, uniform product. Final results, when using MIGHTYPLATE MODIFIED BITUMEN SINGLE-PLY ROOFING MEMBRANE, are not as dependent on variable field conditions. All roofs move. Changing temperatures cause roofs to expand and contract. Therefore, roofing materials must be designed to move with them. The composition of MIGHTYPLATE MODIFIED BITUMEN SINGLE-PLY ROOFING MEMBRANE allows it to be highly elastic and resistant to cracking and splitting - - even under extreme weather conditions. MIGHTYPLATE MODIFIED BITUMEN SINGLE-PLY ROOFING MEMBRANE adds less than 90 pounds of weight per 100 square feet to the existing roof system. This is much less than conventional hot-applied systems which require gravel, and much less than the ballasted rubber roofs which use large river rock to hold them in place. Since no gravel or river rock is needed or recommended with MIGHTYPLATE MODIFIED BITUMEN SINGLE-PLY ROOFING MEMBRANE, it is easy to make periodic inspections and do necessary maintenance. Texas Refinery chemists, using the broad-ranging knowledge of the petroleum industry, have incorporated a special additive in MIGHTYPLATE MODIFIED BITUMEN SINGLE-PLY ROOFING MEMBRANE which helps resists the damaging effects of oxidation. The result is a product that represents the best technology available today. MIGHTYPLATE MODIFIED BITUMEN SINGLE-PLY ROOFING MEMBRANE is easy and clean to work with. Experience comes quickly. Application is straight-forward and uncomplicated. To assure proper adhesion, heat both surfaces to the melt point and roll it on. It literally vulcanizes itself to the existing surface. For convenience, the rolls are marked to assure proper overlaps and alignment. Application can be made in either hot or cold weather. The existing roof system must be clean and dry. 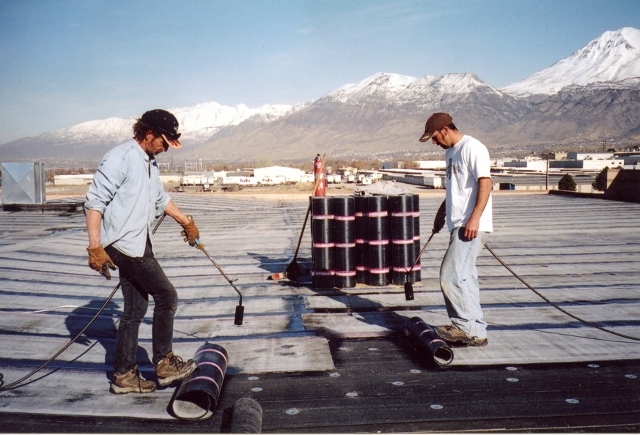 MIGHTYPLATE MODIFIED BITUMEN SINGLE-PLY ROOFING MEMBRANE is ideal for new roof construction or for application of waterproofing membranes over existing roof systems coated with hot asphalt, cold-process coatings, and most other applications. With recommended seam and end over-laps . . .
1 roll covers 98 square feet. An illustrated application booklet, including complete instructions, is furnished with each Order. MIGHTYPLATE MODIFIED BITUMEN SINGLE-PLY ROOFING MEMBRANE available in Roll size 18" x 32'9" for Flashing Work. Include an aluminum roof coating using either TRC's ALUMINUM ROOF COATING or TEXOTROPIC FIBERED ALUMINUM ROOF COATING. 1 x 10 meters = 107.6 sq. ft.